Having cats is kind of like having kids in the house – the parents have as much fun buying cat toys as the cats have receiving them. One of the best things about owning a cat is their curious and playful nature. According to the experts, cats that are kept mentally stimulated lead longer and healthier lives. Satisfy the kitten in your cat. The Tick Tock Teaser is an interactive cat toy that your cats will love. With two moving targets, the Tick Tock Teaser will bring out the predator in your cat. 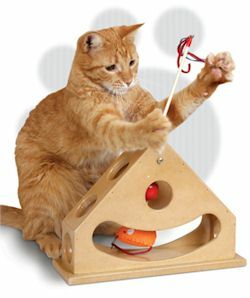 It is very important for indoor-only cats to get mental and physical stimulation. The Tick Tock Teaser is made to challenge your cat to capture the mouse by batting it back and forth, keeping him occupied for hours.